What Chemicals Remove Ink From Paper? Ink is a liquid that contains a large quantity of dyes and is used for writing, drawing or printing on surfaces. The dyes used in ink are generally partially soluble in water but completely soluble in organic solvents. This means that organic solvents remove ink from most surfaces, including paper. 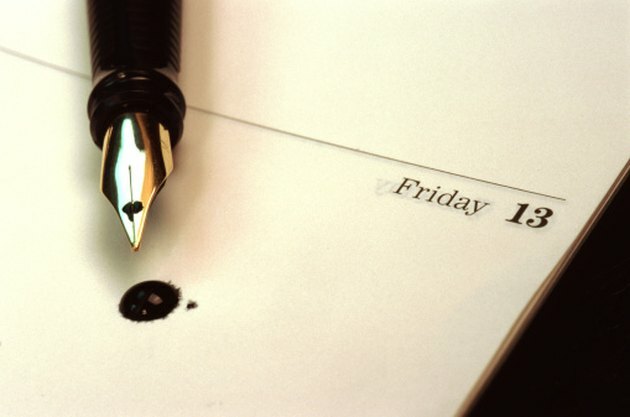 Some readily available chemical solvents that can remove ink from paper include acetone, alcohol and detergents. Some enzymes can also be used to remove ink without damaging the paper. Depending on the paper and the constituents of the ink, partial to full removal of the ink is possible. Organic solvents can be used to remove ink stains from paper. Acetone is a powerful organic solvent that can be used to easily and quickly remove ink from paper. It works on most types of ink, regardless of the constituents, and is cheaply and readily available. It will remove most ink without causing any damage to the paper. Acetone is the major ingredient in nail polish remover. Pure acetone is also available in hardware and beauty supply stores as it is used as a household cleaner and as a solvent for many other chemicals. Alcohol is also a powerful organic solvent that will dissolve most types of ink without causing damage to the paper. There are many different types of alcohol available on the market, all of which remove ink stains. The most common sources of alcohol for this purpose are isopropyl alcohol, which is sold in drugstores and contains a high concentration of alcohol dissolved in water, and alcoholic beverages, which contain lower concentrations of alcohol along with other ingredients. Alcohol sources that contain large concentrations of water may cause damage to paper. Detergents and household soap are effective at removing most ink stains from paper. The ink dyes are attracted to the detergent molecules, allowing the detergents to surround and lift the ink molecules from the paper, in much the same way as detergents remove dirt from clothes. The ink dissolves into the detergent and is washed away with rinse water. The water used to rinse the detergent may cause damage to the paper, especially if you rub too vigorously. Enzyme mixtures can be used to remove ink from paper. The enzymes completely remove the ink particles from the paper without causing damage to the underlying paper. This method is used in large recycling facilities where the paper needs to be de-inked and reused. It is considered to be more environmentally-friendly than using organic solvents to dissolve the ink out of the paper. What Makes a Paper Towel Strong?